Features 2 Column, 1 Right Sidebar, Green, Blue, Gray, Auto Readmore, Web 2.0, Rounded Corner, Bookmark Ready. 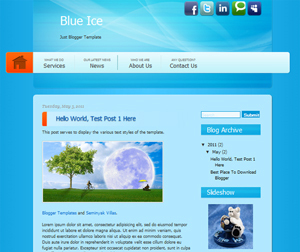 Descriptions Blue Ice is free blogger templates, very simple, blue, elegant with gradient, texture and social bookmark ico on header. Menu very good and make this blogger templates very professional for personal design, very elegant for business sites and you can added content about you and your business on two column footer.